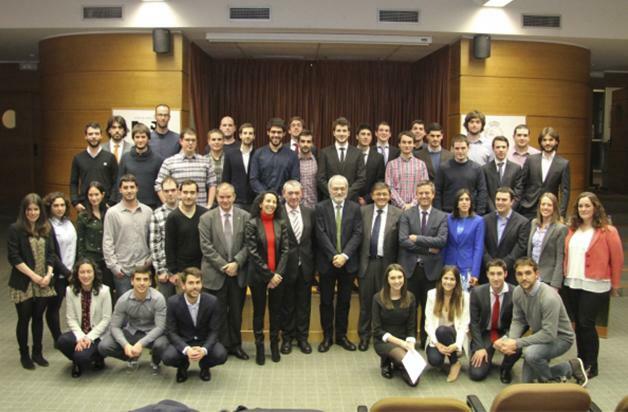 15 March, 2016On 10 March, the Bilbao Engineering School held its diploma presentation ceremony for students from the last promotion of the Machine-Tool Class and the Aeronautics Class. The ceremony was held in the School’s Assembly Hall, with the attendance of academic authorities and of members of the Basque Government, as well as representatives from these two strategic sectors in the Basque industrial fabric. The presentation included interventions by the director of Universities of the Basque Government, Javier Alonso; the director of Technology and Strategy of the Basque Government, Leyre Bilbao; the general secretary of the UPV/EHU, José Luis Martín; the director general of AFM Advanced Manufacturing Technologies (Association of Manufacturers of Machine-Tool, Accessories, Components and Tools), Xabier Ortueta; the director of the Hegan Cluster, José Juez, and the director of the School, Enrique Amezua. A total of 24 students from the Aeronautics Class and 23 from the Machine-tool Class received their diplomas in what were the fourteenth and the seventh promotions, respectively, of these two academic initiatives of the Bilbao Engineering School. Between the two, they have already provided about 500 highly specialized engineering professionals. The majority of them now form part of Basque companies belong to these two essential sectors for local industry. Although some of the students who have passed through these two classes are also now living in countries in Europe, North America, China or South Korea, working in top world class research centres and companies.